Round 2 of the Newland and Associates WA KZ Series has been won and run. Tyler Nastasi was chosen to be the Arrive and Drive entrant, racing with a supplied kart and engine for the weekend. We got to catch up with him post race! It’s been a few days since the race meeting last weekend and what a full on day it was. Tyler, now you’ve had a few days to rest and regroup, how did you feel the weekend went? I thought it was an amazing weekend. Starting Friday practice off with some good times, I went to bed that night feeling quite confident I had good pace and would go into qualifying Saturday morning with a mid-pack finish in hand. The weekend started off brilliantly going much better than expected, putting the kart position 3 in qualifying, just under 2 tenths off pole position. Racing was a different story obviously. 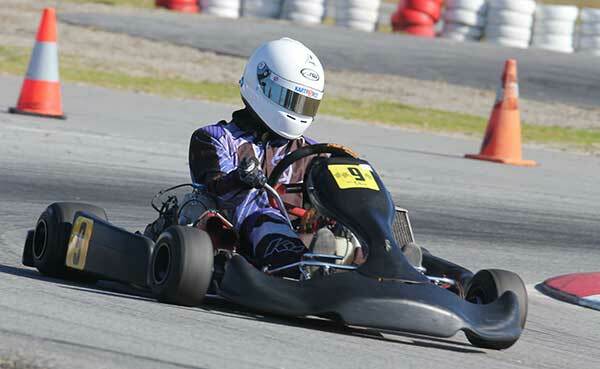 In the kart I learnt quickly that it is important to save the tyres and not burn them out within the first few laps. Bogging down on the start in the first heat and also the final, and slower karts in front of me in the other two races often sent me last at the start but I always pushed hard and found my way back through the field to finish in positions 6, 10, 7 and 8th in the final. Even after a strong qualifying, I was happy with the positions I finished, often doing only a tenth or more off the fastest lap times in all the races. What were you most happy about during the weekend? Obviously kicking the weekend off positively putting the kart position 3 in qualifying was a massive highlight. And seeing dad’s face when the commentator read my name out as position 3 and all the more experienced drivers around me congratulating me on the in-grid felt excellent for me. That probably would have been the highlight of the weekend, along with the massive learning curve of racing the kart and making Dad proud of my accomplishments. It’s been a few days now, how has your body held up? My body hasn’t felt the strain too much. Racing two classes on Saturday was a large task to find the energy for each race, but plenty of snacks and fluids got me through. Other than some bruises on the back of my ribs from the seat, and some mega arm pump from holding onto the power of the KZ, my body is feeling quite good. Now, after the meeting, how do you think the experience in the KZ kart has furthered your racing career? Well, the experience was amazing. I learnt so much about the Kart, learnt how to push myself a little harder and learnt on a whole new level about tyre wear and preservation. The main aspect now after the race meeting is it gave me the opportunity to show Dad mainly, and myself also, that I can drive these karts and take that step up into the shifters and race at the top level. It also got Dad thinking and looking into getting a kart for the rest of the year, which is a massive plus on top of it. I can’t thank the WA KZ Committee and Pete Newland and Dan Curry for organising the Kart and the weekend for me. It was absolutely brilliant to mix it with all of them and get some really good results.